You’ve acquired your NPI-1 and NPI-2. Done! Can I just forget about it? Well…if any of your information changes like your name, address, practice location, specialty, etc you need to login to NPPES and update your information. 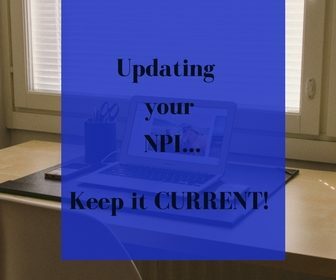 You always want your NPI and CAQH to be updated. So, here’s a quick video walking you through how to update your information. If you have any questions feel free to email me at credentialing@masteringinsurance.com or ask in the Mastering Insurance for Mental Health Professionals Facebook group! Previous Previous post: NPI-1 and NPI-2. Do I need both? Next Next post: 5 reasons your claims are being denied!